For the energetic and those looking to relax alike, Beijing can be a challenge. No one seems to walk anywhere and the ‘nine million bicycles’ that Katie Melua sang about have all but vanished. Even if you just want to chill out rather than stretch your legs, you’ll find public parks invaded by dancing retirees and shrieking teenagers in rowboats. But there’s one place in Beijing where you can still walk or pedal all morning and barely see a car, where people play ping-pong outdoors and sit sipping tea in their slippers. In the Back Lakes district, fat orange fish burp in the water, pagodas peel with the passing of centuries, and you might feel you’ve stepped into a China long forgotten. Yet despite the charm and history you can have contemporary fun too, in back alleys hiding eateries, hip nightspots and boutique hotels. The Back Lakes lie just north of the Forbidden City, and were once home to courtiers and master craftsmen who depended on imperial largesse. 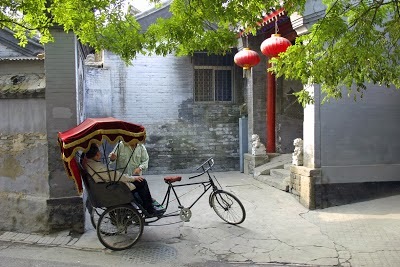 They built large residences arranged around central courtyards and hidden behind high walls, which created narrow walled laneways called hutong. Today, in a city of vast apartment blocks, it’s one of the few places to see Beijingers going about their daily lives: chopping vegetables, reading newspapers and fishing from bridges. Some river-cruise companies offer shore excursions to this area but, if you have free time, it’s also easy to do yourself. The lakes lie just beyond Di’anmen East Road, where taxis drop you into a horde of pedicab drivers. You’d do best to ignore them, since they’re used to pedalling high-tipping American tour groups about. Besides, this area is really about slow appraisal and good walks. Though you’ll find a few temples, defensive towers and small museums, Prince Gong’s Mansion is really the only formal sight. The mansion was built in 1777 by a court favourite and brings together a collection of cedar-wood pavilions set in traditional Chinese gardens of pocket-size ponds and covered walkways. 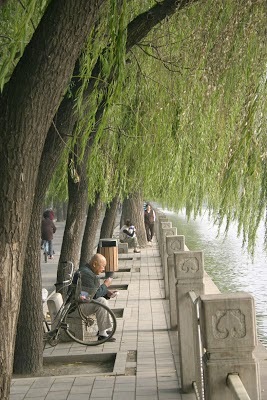 Back Lakes District, Beijing, China. Other than this, the Back Lakes make a pleasant change from serious cultural sightseeing. Looping around all three lakes will take you several hours. If you don’t have time, walk to humpbacked Silver Ingot Bridge, where two of the three lakes meet in a charming vista of waterlilies and willow trees. An eighteenth-century emperor declared it one of the city’s Eight Great Views, and little seems to have changed. In the Back Lakes, you might come across old men in blue Mao jackets pedalling sedately along the cobbled lanes, or neighbourhood wives scraping potatoes on doorsteps. In the evening, red lanterns hang from upturned eaves and the centuries unpeel. Above the distant hum of traffic and construction work a songbird in a cage trills, a lovely lament to a Beijing that is almost obliterated. 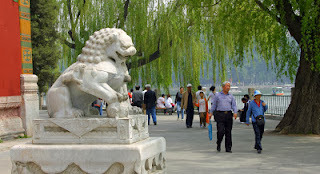 If you’ve been to Beijing’s Back Lakes District and feel you have something to add, please do so. Our readers appreciate your tips and memories.